Andrew Whittaker joined the Peterborough based company to manage its national customers and to ensure that franchisees continue to expand their businesses. Andrew has had a great deal of experience within the franchising industry having previously owned the Peterborough Royal Mail Same Day franchise and Mailtech, a direct mail production company. 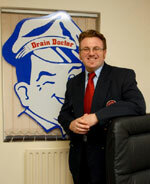 Drain Doctor is franchised across the UK and provides an emergency plumbing and drainage service.